The Minnesota Horse Council announced the selection of Miriam Tschida of Maplewood, MN, as Minnesota's HORSEPERSON OF THE YEAR. The annoucement was made at the MHC Annual Meet-ing on January 19, 2008. Some of the words and phrases that friends have used to describe Miriam are: an inspiration, an institution, generous, selfless and giving, charismatic, tireless, dedicated, amazing, loving and supportive to family and friends. In the Minnesota horse industry, she has been described as knowledgeable, ambitious, funny, super fair, nonjudgmental as to type, breed or discipline, humble, motivating and encouraging, seems to DEVOUR life, and most of all, is optimistic and determined to make lemonade out of lemons. Miriam was involved with every aspect of the horse world, either owning or showing ponies, grade horses, Quarter Horses, Paints, Palominos, Miniatures, Draft Horses, Saddlebred Parade Horses and Arabians in all the different divisions for the breed--both English and Western. Ownership of a boarding and training stable made it possible for Miriam to teach and share the joys of a beautiful sport with untold numbers of people--many who have gone on to be the movers and shakers in the equine world. 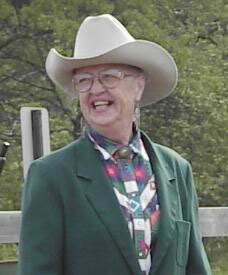 Miriam lent support and her considerable talents over the years to the Western Saddle Club Association, the Minnesota Horse Council, the Minnesota Horse Expo, the State 4-H Association as well as to local 4-H clubs and many saddle clubs, often serving as an officer or chairman of a committee. Diagnosed with cancer of the liver, lung and bone last September, Miriam faced this bump in the road with her usual mixture of determination and optimism. She was a fighter and didn’t back down from this battle. In fact, early in December, after a week of chemotherapy, Miriam judged a show at the Rhino Arena on Saturday and then attended a party held in her honor on Sunday. She was at first embarrassed by all of the fuss about the party, but when told that the horse world felt that it was their turn to give back some of the love and caring that she gave to so many, she reluctantly agreed. She left the party tired but happy, and secure in the fact that life is indeed a gift and every day is special. Sadly, Miriam passed away on March 10, 2008 after a long tough battle with cancer.